Juniper berry taste and aroma with floral scent of hops. Off-white head with good retention. Medium, active amount of carbonation. Light to medium bodied. Slight oak aged taste. 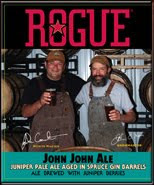 Another of the rare beers of Rogue from the tap, sampled on the east coast of the US. John John was delicious. A tickle of juniper taste and a slight oaked blast towards the end. Not overly hopped; at only 34 IBU it was just right. The play of the hops aromas and juniper taste made for a very pleasing and interesting taste. Tastes wonderfully like a Spruce Pine tree! Great to have a sample of this at "Beertopia" at my local World of Beer and their celebration of Rogue ales on tap.